We were told by the bartender that as locals, we're crazy to be on the Las Vegas strip on a Saturday night. 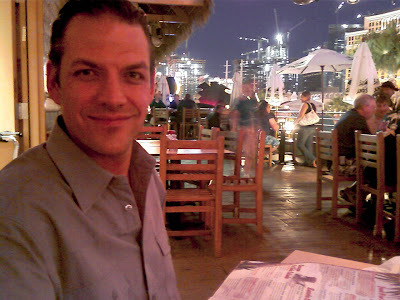 But a fun, casual dining atmosphere with killer margaritas like the ones at Margaritaville is hard to beat. Waiting in line for a table is never a pain, especially with ice-cold margaritas in hand. My husband stops at the bar while I wait for a table. There's something about their margaritas that we love. It never tastes strong but will have you buzzin' before a glass is finished. The night is warm and comfortable and for once I can leave my sweater in the car. At the tables around us, there were bachelorette parties, groups of single guys, and families gathering from different places around the world. I didn't take any photos of our food, peel and eat shrimp and a tilapia sandwich. They weren't much to look at this time around. If anything, I should have taken photos of our drinks! But I thought maybe I should relax tonight and live in the moment rather than through the lens of my camera.